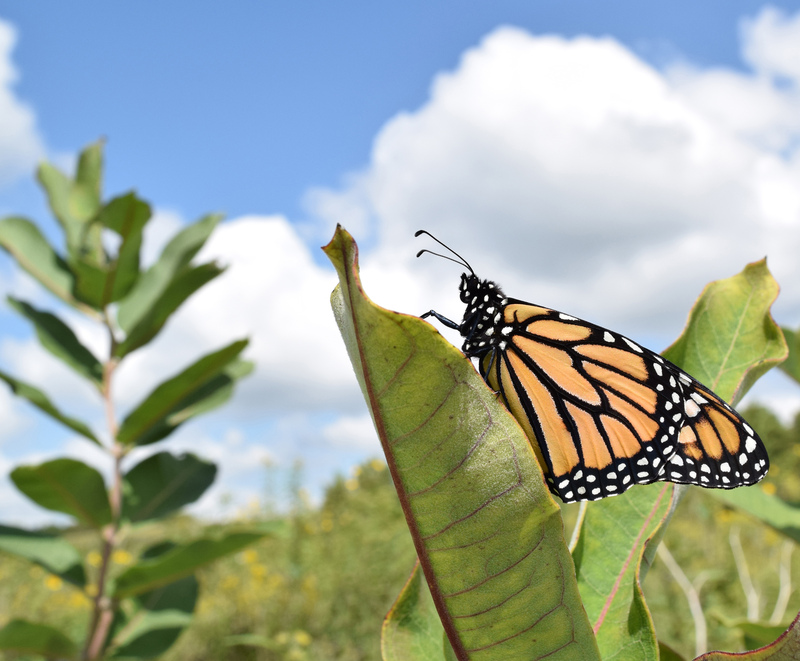 AMES, Iowa — Iowa State University scientists will advance the understanding of monarch butterfly ecology through a grant funded by the U.S. Department of Agriculture’s National Institute of Food and Agriculture Pollinator Health Program. The monarch butterfly population has experienced an 80 percent decline in North America over the last 20 years. The U.S. Fish and Wildlife Service is considering listing the monarch as a threatened species under the Endangered Species Act, indicating the urgency of implementing viable, voluntary monarch conservation programs to avoid a potential listing. Bradbury said such a listing could lead to significant regulatory and management burdens for farmers, livestock producers and other private landowners. The ISU team of researchers will use indoor and field studies to develop landscape-scale models of monarch movement and population responses. Researchers plan to use female butterflies tethered to instruments in a large facility used by Iowa State sports teams, and radio telemetry in the field, to measure the ability of monarchs to perceive and move to milkweed and flowering plants. Milkweed is the only plant monarchs lay eggs on and the only source of food for the young. Adult monarchs rely on nectar from flowering plants for food. “Our current model results indicate we need to better understand the perceptual range of the monarch to improve our ability to predict how different arrangements of habitat patches in the landscape influence population responses,” Bradbury said. Perceptual range is the distance at which monarchs detect milkweed or nectar plants in the landscape. It can be estimated from observations on how a monarch orients its flight towards a resource, like milkweeds. Monarchs flight patterns observed through the radio telemetry studies also will help researchers evaluate the model they are refining. The ISU team is coordinating its studies with researchers in the U.S. Geological Survey, who are developing a conservation model for the entire nation. The Iowa State model will be at a finer scale, and will be applicable to summer breeding monarchs in the North Central states. The project also will determine how pesticides used in crop fields may influence monarch survival and reproduction in habitat located near field borders. Current monarch conservation recommendations call for habitat setbacks of 125 feet from fields on which pesticides are used. This setback includes about 80 percent of roadsides and about 40 percent of non-crop fields in Iowa, eliminating a lot of land that could be used to establish new habitat. The researchers will study how herbicides affect the quality of milkweeds and how insecticides impact monarch caterpillars at varying distances from field edges. “Through this research we will be able to determine if summer monarch populations have a greater rate of increase if we plant habitat near crop fields, even if some milkweed and some monarchs get exposed to pesticides sometimes, as compared to a conservation plan where no new habitat is established near field borders,” he said. Bradbury said the model they develop will support conservation planning at county, state and regional scales. In March, the Iowa Monarch Conservation Consortium released its updated conservation strategy. The strategy guides the implementation and documentation of a voluntary, statewide effort based on the best available science. The consortium is a diverse group of more than 45 collaborators, including agricultural and conservation organizations, agribusiness and utility companies, county associations, universities and state and federal agencies. More information about consortium members, partners and the strategy is available at: www.iowamonarchs.info. A monarch butterfly on a milkweed plant.